Hall Of Fame Slugger Willie McCovey Dies At Age 80 McCovey was known as one of the most powerful left-handed batters in baseball and is tied for 20th on the all-time home run list. 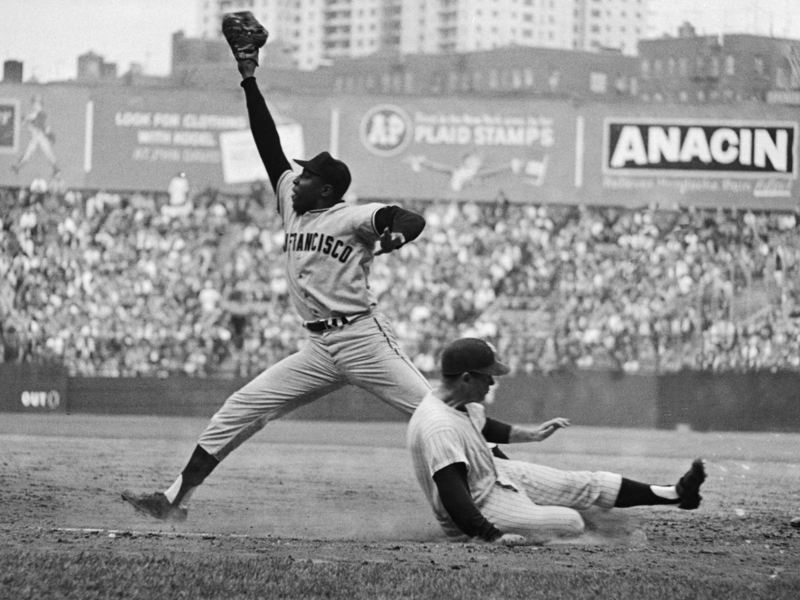 Willie McCovey stretches for a throw during the 1962 World Series between the San Francisco Giants and New York Yankees. Hall of Fame first baseman and one of the most beloved former members of the San Francisco Giants, Willie McCovey died Wednesday. His death at age 80 was announced by the Giants. The team didn't specify an exact cause of death, citing instead "on-going health issues." McCovey was nicknamed "Stretch" because his height at 6-foot-4. Left-handed throwing made him a natural at first base. He was best known for his 521 career home runs, 18 of which were grand slams — the most by any player who spent his career exclusively in the National League. McCovey was the National League's home run leader three times and RBI king twice in his 22-season career. He played 13 of those years on the Giants with teammate Willie Mays and together they formed one of the most powerful hitting duos in baseball history. A native of Mobile, Ala., McCovey announced his arrival in baseball's major leagues in July 1959 when he debuted batting 4-for-4, hitting two triples and two singles, scoring three runs and batting in two other runs. He batted .354 overall and won the National League's Rookie of the Year award despite playing only 59 games that season. Ten years later in 1969, McCovey was the NL's Most Valuable Player, after leading the league with 45 home runs, 126 RBIs and an on-base percentage of .453. McCovey spent 19 of his 22 major league years with the Giants. He was traded to the San Diego Padres in 1973 and then played briefly with the Oakland A's in 1976. He returned to the Giants in 1977 hitting 28 home runs and winning the Sporting News NL Comeback Player of the Year award. "One honor that eluded McCovey was a World Series ring. He came close in 1962, coming up short in a nail-biting seven-game series against the Yankees. McCovey went to the plate with two outs in the bottom of the ninth inning, his team down 1-0, with runners on second and third base. McCovey sliced a hit toward right field that looked like it could drive in the winning run but instead was caught by Yankees second baseman Bobby Richardson to end the game and the series. The moment was so iconic that it was featured in a Peanuts comic strip." That comic strip is shown here. McCovey retired in 1980 and voted into the Hall of Fame in 1986, and stands tied for 20th on the league's all-time home run list. He remained a fan favorite over the years, making frequent appearances at AT&T Park and always projecting an easy-going, dignified demeanor. In 1980, the Giants established the "Willie Mac" Award, an honor bestowed on the player who "best exemplifies the spirit and leadership" shown by McCovey. The San Francisco Bay water just beyond the right field wall at the park is known as "McCovey's Cove" even though he never played in that stadium. A statue of McCovey stands at the mouth of the Cove.